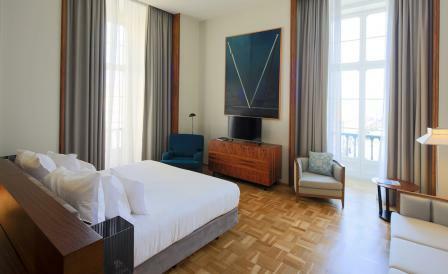 The latest filly to join hotel group Pestana’s stable, is housed in a regal 18th-century ochre yellow Pombaline palace, once home to Portugal’s Interior Ministry. Inside the 90-room property, no expense has been spared, with a mix of modern and classic artworks - surplus from the city’s museums and galleries - lining the plush corridors which lead to the spa, indoor swimming pool and fitness centre on the third floor. Cascais-based architect David Sinclair led the rehabilitation project with Brazilian interior designer Jaime Morais and civil engineer Ana Melo, transforming a space massacred by years of misuse, restoring everything from the chandeliers to the stained glass windows, adding ecclesiastical purple carpeting that lends an almost spiritual air. A ground floor cocktail bar and restaurant, with vaulted red brick ceilings, is overseen by up-and-coming chef Tiago Bonito, whose menu - traditional Portuguese with a modern twist - makes the best of local ingredients, including beef, sausages and cheeses from the Alentejo and fresh shellfish from the Algarve. An outdoor terrace is the ideal spot for a long boozy lunch, while watching the hustle and bustle of Lisbon’s main square, before meandering up to the lavish, cavernous oak panelled Dom Perignon suite, once the office of Prime Minister António Salazar, the country’s authoritarian ruler until the 1974 revolution.